There’s a truism about photographers who like to try different types of shots, just to see how well they can pull them off. And that’s that everyone needs a good moon shot. It’s probably not surprising that so many people have tried to take photos of the moon, after all, you can see it from every continent on Earth and it’s easily the most noticeable object in the night sky. But while nearly all photographers try to take photos of the moon at some point, many find it difficult to get a really satisfying result. Having tried several different approaches to photographing the moon, I’ve realised there are two areas which need some consideration – exposure and equipment (in that order). Getting the right exposure is tough because the moon is a lot brighter than you think, and brighter than just about everything else in the night sky. It is an object bathed in (and reflecting) direct sunlight, and your exposure should account for this. Normally, to take shots of stars, you need a wide aperture and high ISO to gather enough light to get a useable exposure, without creating long star trails or without a some kind of tracking/rotating mechanism to account for the earth’s rotation. For the moon, however, this sort of setup would massively over-expose the moon, creating a burned out homogenous blob. For this reason, when shooting the moon, if properly exposed no stars will be visible in the same exposure (though some shots can be combined very effectively). The moon also moves relatively quickly across the sky, so any exposures of more than a couple of seconds will “smudge” (how noticeable this is will depend on your focal length / magnification). To get a really crisp shot, it’s normally best to aim for a low ISO, an optimum aperture of around f/16 and an exposure of well under a second. Always try to use a tripod of you want things to be really sharp (though, because it is bright, it IS possible to shoot the moon handheld). If you are using in-camera auto exposure, then you are likely to need to dial in several stops of exposure compensation, or you will need to use spot metering, as the dark mass of surrounding night sky will fool the camera into over-exposing the moon. The new wave of super-zoom bridge cameras (with 42x or 50x optical zooms) have a far enough reach to photograph the moon as the primary subject. At these very long focal length, a tripod is pretty much essential – especially when using Bridge cameras which tend to have smaller front-elements and are therefore less good at gathering sufficient light than dedicated fixed focal length tele-lenses. Auto-focus can also be tricky, so switch to manual focus and zoom in, in live view, if possible to get things pin sharp. If you want to get really good images, then you will probably want to get a fixed focal length telescopic lens. 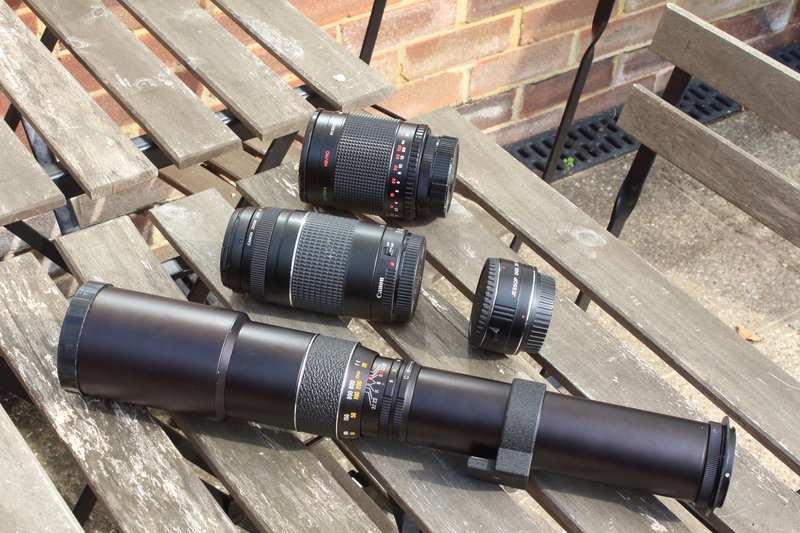 These don’t need to be really expensive, especially if you get a t-mount or M42 mount manual focus lens, such as the Photax / Optomax / Sunagor 500mm f/8 lens (or another similar design). You can pick these up second hand for as little as £25, and coupled with a tele-converter, they provide a huge reach. The shot below was taken with this setup and is pretty crisp and free from chromatic aberrations etc. Manual focus is pretty easy using live view. 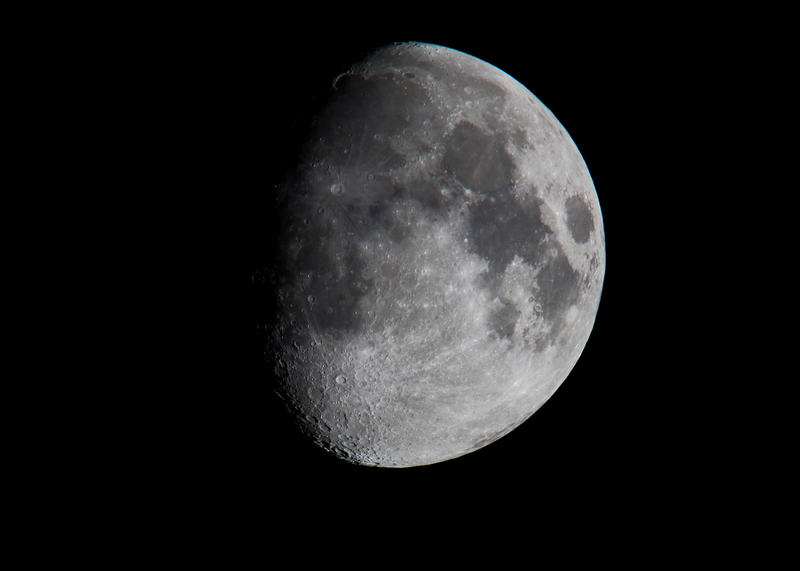 Waxing (Gibbous) moon – shot using a manual Optomax 500mm f/8 lens (at f/16) and a 2x teleconverter, on an APS-C DSLR. This gave a 35mm equivalent focal length of 1600mm. The exposure was 1/15th second. Opteka 500mm f/8 mirror, in this case paired with a 2x teleconverter giving a whopping 1,000mm focal length (1,600mm equivalent on full frame). The image is virtually free from Chromatic aberration, which would be a major problem with a multi-element optic. 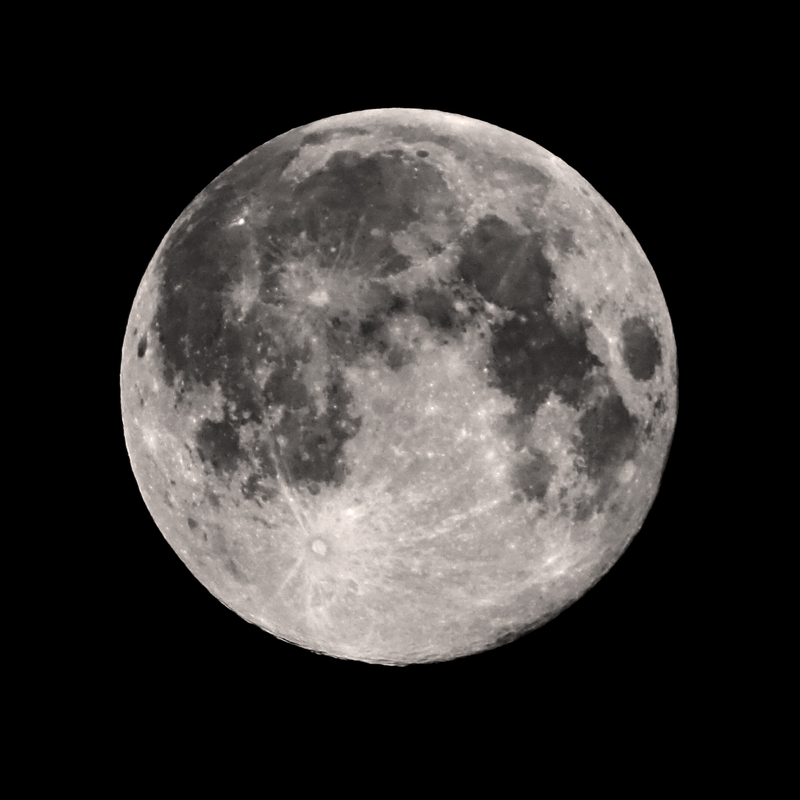 Full moon – shot at 600mm on an APS-C camera, using a 2x teleconverter and a 75-300mm Canon zoom lens at full extension. While this is no-where near as clear as the results achieved with the manual focus, fixed length lenses, it is a significant improvement on the results I have achieved with a bridge camera with an 18x telephoto zoom (although more powerful zooms are now available). No matter what camera you are using, you often get the best results photographically when you shoot the moon in a waxing or waning phase, rather than full (or nearly full). 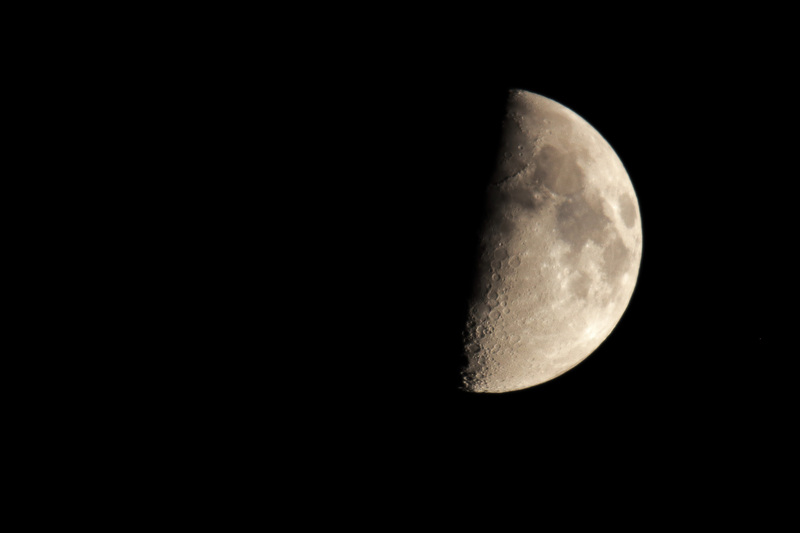 This is because the shadows across the craters on the moon’s surface are longer, darker and have greater contrast in the lunar twilight, between day and night (or the light and dark side’s of the moon). Another point worth noting (given the time of year) is that some of the clearest, stillest nights come during the winter – so get your gloves on at night over the next few nights, and get out shooting! Previous PostMaking the most of what you’ve got…Next PostThe £200 challenge… A full DSLR kit for a range of situations, for the same cost as a bridge camera?